The Extra Large Dog House is our most popular size house. It has the same huge door that all of our larger size houses have (18” x 26”) and comes standard with a heavy duty vinyl flap door, and a window with shutters, installed. The inside dimensions of 44” x 44” will easily accommodate very large dogs…see our sizing guide by breed. This size house has often been purchased for multiple dogs. House pictured with optional porch & deck. The Extra Large Dog House is our most popular size house. It has the same huge door that all of our larger size houses have (18” x 26”). The inside dimensions (44” x 44”) of our extra large house will easily accommodate very large dogs…see our sizing guide or our estimated dog house sizes by breed. This size house has been purchased often for multiple dogs. The Extra Large house was the first dog house designed and manufactured by Blythe Wood Works over 25 years ago. 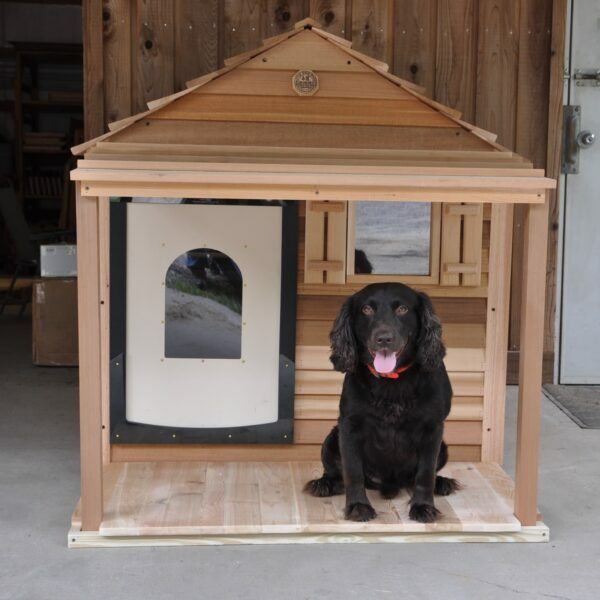 Through all of those years we have designed and engineered many options that make it possible for you to custom design the dog house to best suit your dog(s), in the climate you live in. As with all of our houses, the Extra Large house comes as seven predrilled, easy to assemble panels. Each house comes with a heavy duty vinyl flap door, installed.